High strength acrylic paint, with long lasting durability. Due to the special fungicidal components contained within its formula, it can protect the film of paint created on plaster and concrete surface as it does not promote mold creation, algae and bacteria or fungi growth, outdoors. Distinguished by its high performance and coverage. It does not saponify. It maintains the breathability of surfaces, being at the same time water vapour permeable. It is high resistant to the alkali of surfaces. Ideal for the long lasting protection of buildings exposed to permanent moisture, snow and sea salt. Available in white that can be colored in 120 colors using DUROCOLOR, the Measuring System for Shade Rendering in 20ml syringe packaging. 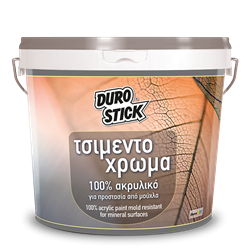 1kg/6-8m² per coat, on properly prepared surfaces.